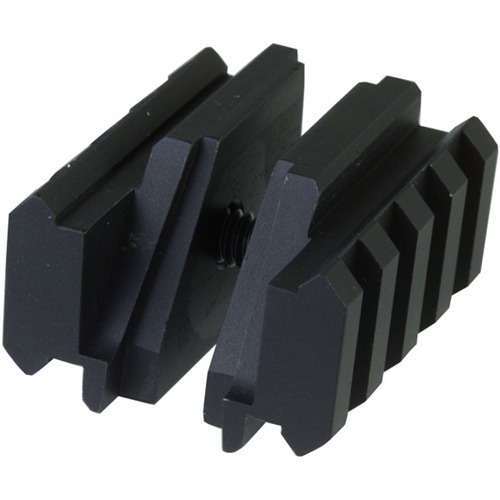 Solidly clamps to either side of an AR-15, front sight base. Features two Picatinny rails for holding lights, lasers, sling adapters and other accessories. Machined for a secure fit so it won't rotate or twist out of alignment. SPECS: Aluminum, anodized, black, matte. 1¾" long. 2.3 oz. (66 g) wt. Solid klemmer på begge sider av en AR-15, foran synet base. Har to Picatinny rails for å holde lys, lasere, slynge adaptere og annet tilbehør. Maskinert for sikker passform slik at den ikke Roter eller vri justert. Spesifikasjoner: aluminium, eloksert, svart, Matt. 1¾" lang 2.3 oz. (66 g) wt. Easy to install in just a few minutes, as well as remove just as easily! Holds tight and in place even during full auto bursts! Makes mounting accessories easy, and versatile for either side of weapon. Excellent value for the money! I installed this Atlas sight tower rail on my Colt 6920 because I prefer the stock carbine non-rail hand guards. The Atlas Accessory Light Mount fit exactly right, holds a Surefire 6PX Pro rock solid. If this thing breaks, it'll be because it took a bullet. The mount is tapered correctly so your rails are perpendicular to the 90 degree axis, just like they should be. Produsentnr. : 3070010 Solid klemmer på begge sider av en AR-15, foran synet base. Har to Picatinny rails for å holde lys, lasere, slynge adaptere og annet tilbehør. Maskinert for sikker passform slik at den ikke Roter eller vri justert.